This painting, Verismo, is based on an early renaissance painting of an imaginary Ideal City, probably by Luciano Laurana and now in the Palazzo Ducale in Urbino. 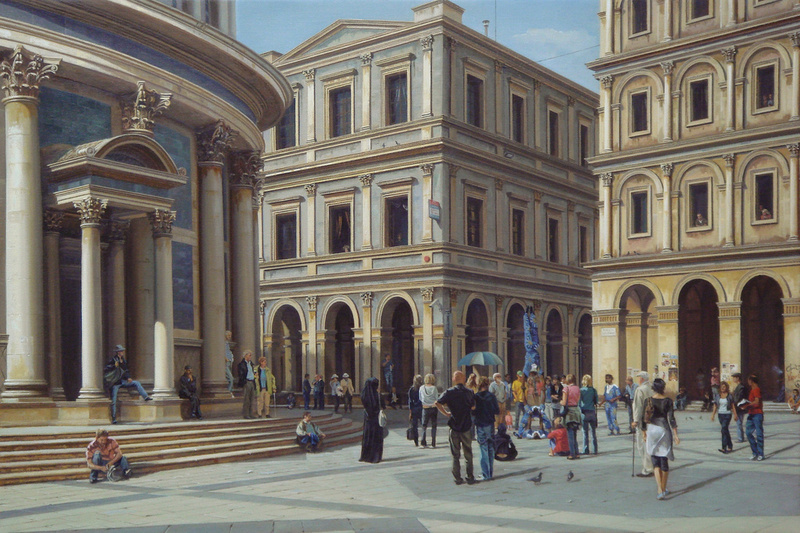 Verismo imagines that Laurana’s Ideal City had been built and the city centre has survived into the present day. Initially given the working title, “The Effects of Bad Government”, in reference to Lorenzetti’s fresco cycle in Siena, The Effects of Good Government, the title was changed to Verismo which literally means realism, but is also a more specific reference to the kind of gritty realism of 19th century opera to which the term was applied, dealing with real people in commonplace situations rather than classical ideals or great historical events. 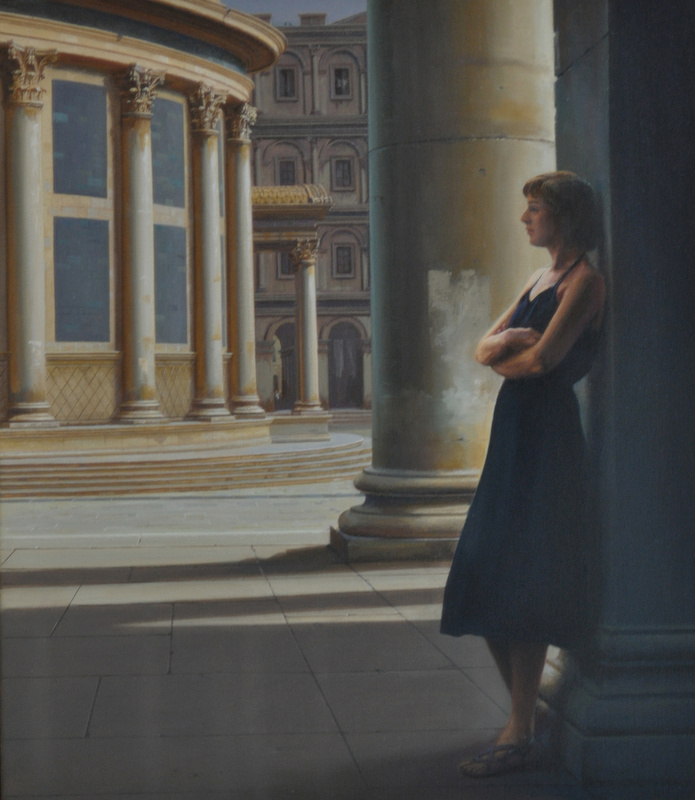 Originally inspired by my daughter Lucie’s interest in utopias as a dissertation topic and David Watkin’s reference to both of the above renaissance works in the text he was writing for the book on my paintings, Verismo was initially intended as a sinister or at least cynical work, showing how classical ideals have been debased by our modern environment. Laurana’s city centre has suffered from age, weather, development (although apparently well regulated as the city centre has survived intact! ), a market economy and all the clutter that the modern world imposes on the city in the way of street furniture, traffic control, surveillance equipment and most importantly the chaotic and unpredictable activity of the city’s inhabitants, conspicuously absent in the fifteenth century original. This act of sedition, which was meant to turn Laurana’s pristine and perfect architecture into a dark and sinister urban nightmare, more Fellini than Filarete, happily seems to have failed. The painting took on a life of its own and the power of Laurana’s architecture asserted itself as the painting developed. The architecture still presides with dignity over the piazza which now teems with life. Human activity predominates and the clutter of the modern city loses its negative connotations in the sheer exuberance of it all. A predominantly pessimistic exercise has transformed itself into an optimistic image of the city. The end result is a positive view both of an idealistic concept which is a fitting setting for human activity and of the effects of humanity in tempering that concept. 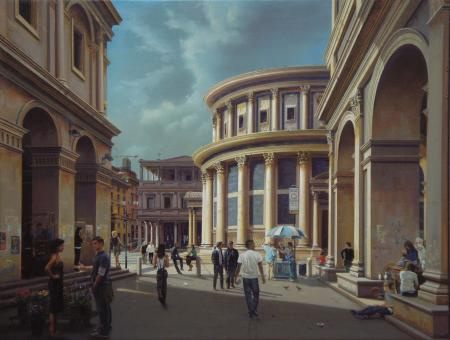 The original painting’s role as an exercise in perspective is considered in the other paintings in this series, which take us on an architectural promenade through the Ideal City, abandoning Laurana’s centralized, one point perspective for the more contemporary accidental view one might encounter in a modern city, and conveying the notion which David Watkin expresses when discussing Laubin’s Atlantis painting done for Leon Krier in his text, that “modern man is still the heir to the luminous ideals of classical culture”.